What are Pure Lands in Buddhism? The "pure lands" of Buddhism can sound a little like heaven; places where "good" people go when they die. But that's not what they are. There are, however, many different ways to understand them. A "pure land" often is understood to be a place where dharma teachings are everywhere and enlightenment is easily obtained. This "place" may be a state of mind rather than a physical place, however. If it is a physical place, it may or may not be physically separate from the mundane world. However one enters a pure land, it is not an everlasting reward. Although there are many kinds of pure lands, for the unenlightened they are best thought of as a place where one may dwell only for a time. Although pure lands are mostly associated with the Pure Land traditions, such as Jodo Shinshu, you can find references to pure lands in commentaries by teachers of many Mahayana schools. Pure lands also are mentioned in many Mahayana sutras. The concept of a pure land appears to have originated in early Mahayana.in India. If enlightened beings choose to not enter Nirvana until all beings are enlightened, it was thought, then these purified beings must live in a purified place. Such a purified place was called a Buddha-ksetra, or Buddha-field. Many different views of pure lands arose. The Vimalakirti Sutra (ca. 1st century CE), for example, teaches that enlightened beings perceive the essential purity of the world, and thus dwell in purity -- a "pure land." Beings whose minds are muddled by defilement perceive a world of defilement. Others thought of pure lands as distinctive realms, although these realms were not separate from samsara. In time a kind of mystical cosmos of pure lands emerged in Mahayana teaching, and each pure land became associated with a particular Buddha. The Pure Land school, which emerged in 5th century China, popularized the idea that some of these Buddhas could bring unenlightened beings into their pure lands. Within the pure land, enlightenment could easily be realized. A being who did not achieve Buddhahood eventually might be reborn elsewhere in the Six Realms, however. There is no fixed number of pure lands, but there are just a few widely known by name. The three you will most commonly find referenced in commentaries and sutras are Sukhavati, Abhirati, and Vaiduryanirbhasa. Note that directions associated with particular pure lands are iconographical, not geographical. Sukhavati the "realm of bliss," is ruled by Amitabha Buddha. Most of the time, when Buddhists talk about THE Pure Land, they are talking about Sukhavati. Devotion to Amitabha and faith in Amitabha's power to bring the faithful into Sukhavati is central to Pure Land Buddhism. Sutras of the Pure Land school describe Sukhavati as a place filled with gentle light, the music of birdsong and the fragrance of flowers. Trees are adorned with jewels and golden bells. Amitabha is attended by the bodhisattvas Avalokiteshvara and Mahasthamaprapta, and he presides over all sitting on a lotus throne. Abhirati, the "realm of joy," is thought to be the purest of all pure lands. It is ruled by Akshobhya Buddha. 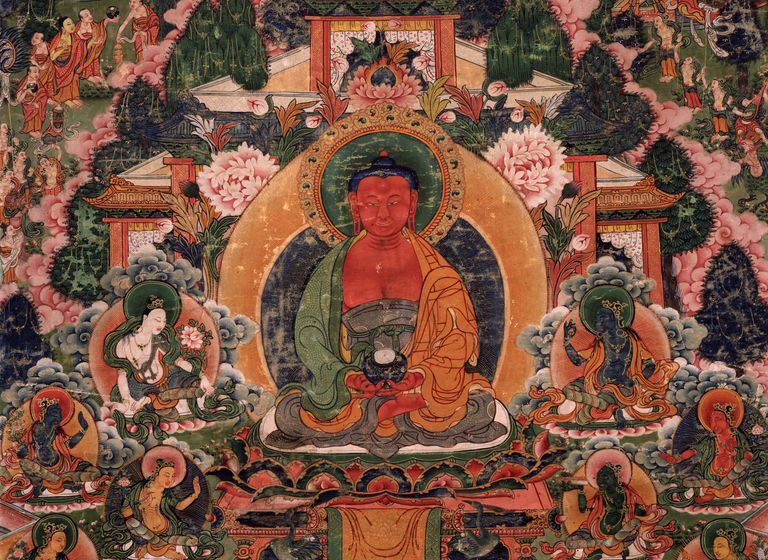 There was once a tradition of devotion to Akshobhya in order to be reborn in Abhirati, but in recent centuries this was eclipsed by devotion to the Medicine Buddha. The name Vaiduryanirbhasa means "pure lapis lazuli." This pure land is ruled by the Medicine Buddha, Bhaisajyaguru, who is often depicted in iconography holding a lapis blue jar or bowl containing medicine. Medicine Buddha mantras often are chanted on behalf of the sick. In many Mahayana temples, you will find altars to both Amitabha and Bhaisajyaguru. Yes, there is a Southern Pure Land, Shrimat, ruled by Ratnasambhava Buddha and a Northern Pure Land, Prakuta, ruled by Amoghasiddhi Buddha, but these are far less prominent.